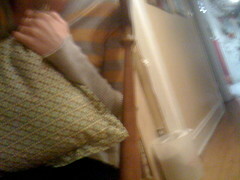 Check out my flanged pillow! i bought this fabric for a dress but the sizing didn't wash out and it's too stiff. so home decorating instead! it matches our dining room very well so i made chair pads for our dining room chairs. one day in the cats have already ripped one off its ties and spilled coffee on the other. but besides that they look good!